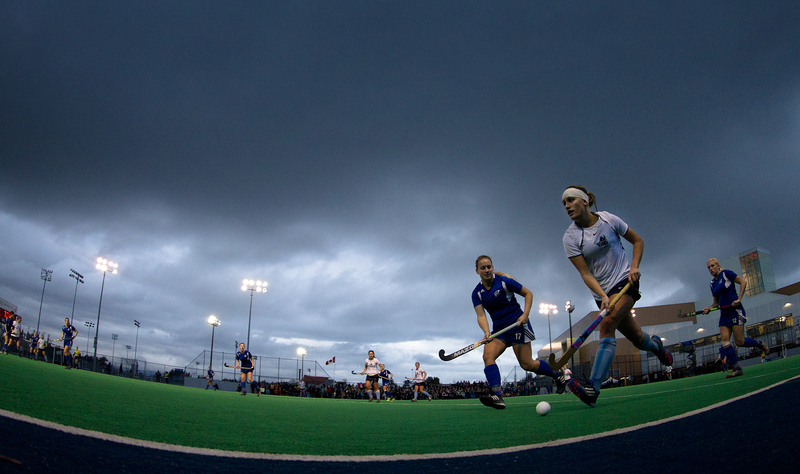 The University of Victoria Vikes play host to the University of British Columbia Thunderbirds in the gold medal match of the CIS Women’s Field Hockey Championships on November 8th, 2015 in Victoria, British Columbia, Canada. The Vikes couldn’t hold on to a 2-1 lead eventually losing 3-2 (3-1 in penalty shots) to the Thunderbirds who claimed their fifth straight McCrae Cup. University of British Columbia Thunderbird Sarah Keglowitsch fights off three Victoria defenders during what would eventually be a 3-2 UBC victory (3-1 in penalty shots) over the University of Victoria Vikes in the gold medal match of the CIS Women’s Field Hockey Championships on November 8th, 2015 in Victoria, British Columbia, Canada. The University of British Columbia Thunderbirds celebrate their first of two goals in a 3-2 victory (3-1 in penalty shots) over the University of Victoria Vikes in the gold medal match of the CIS Women’s Field Hockey Championships claiming their fifth straight McCrae Cup on November 8th, 2015 in Victoria, British Columbia, Canada. On the play Uvic defender Lizzie Yates caught goalkeeper Lizzie Yates goal stick in the head causing her to receive medical attention. Yates remained in the game scoring a goal for the Vikes. University of Victoria Vike Lizzie Yates walks off the field after getting hit in the head by her goaltender Larissa Piva stick in the gold medal match of the CIS Women’s Field Hockey Championships versus the University of British Coiumbia Thundersbirds on November 8th, 2015 in Victoria, British Columbia, Canada. Lynne Beecroft Head Coach for the University of Victoria Vikes talks to her team during halftime of the CIS Women’s Field Hockey Championships versus the University of British Columbia Thunderbirds on November 8th, 2015 in Victoria, British Columbia, Canada. University of Victoria Vike Lizzie Yates runs down the sideline away from University of British Coiumbia Thundersbird Alyssa Nonis in the gold medal match of the CIS Women’s Field Hockey Championships on November 8th, 2015 in Victoria, British Columbia, Canada. University of Victoria Vikes fans chear their team on during the gold medal match of the CIS Women’s Field Hockey Championships versus the University of British Columbia Thunderbirds on November 8th, 2015 in Victoria, British Columbia, Canada. University of Victoria Vikes Lizzie Yates runs after the ball after University of British Columbia Thunderbird Amy Jones attempted a pass through the goal mouth in the gold medal match of the CIS Women’s Field Hockey Championships on November 8th, 2015 in Victoria, British Columbia, Canada. University of British Columbia Thunderbird Gabby Jayme puts a shot on Uvic goalkeeper Larissa Piva in the last minute of the gold medal match of the CIS Women’s Field Hockey Championships versus the University of Victoria on November 8th, 2015 in Victoria, British Columbia, Canada. University of Victoria Vike Head Coach Lynne Beecroft can’t watch as the University of British Columbia was awarded a short corner with under a minute to play in the gold medal match of the CIS Women’s Field Hockey Championships on November 8th, 2015 in Victoria, British Columbia, Canada. The Thunderbirds would score tying the game at two and eventually winning 3-2 (3-1 in penalty shots) claiming their fifth straight McCrae Cup. University of British Columbia Thunderbird Hannah Haughn and #3 Gabby Jayme jump into the air following a last minute game tying goal in the gold medal match of the CIS Women’s Field Hockey Championships versus the University of Victoria on November 8th, 2015 in Victoria, British Columbia, Canada. University of British Columbia Thunderbird Sarah Keglowitsch scores a penalty shot goal on Uvic goalkeeper Larissa Piva during the gold medal match of the CIS Women’s Field Hockey Championships on November 8th, 2015 in Victoria, British Columbia, Canada. University of British Columbia Thunderbird Hannah Haughn jumps into the arms of goalkeeper Rowan Harris following a 3-2 victory (3-1 in penalty shots) over the University of Victoria Vikes in the gold medal match of the CIS Women’s Field Hockey Championships claiming their fifth straight McCrae Cup on November 8th, 2015 in Victoria, British Columbia, Canada. University of British Columbia Thunderbird Hannah Haughn lets out a joyful scream following a 3-2 victory (3-1 in penalty shots) over the University of Victoria Vikes in the gold medal match of the CIS Women’s Field Hockey Championships claiming their fifth straight McCrae Cup on November 8th, 2015 in Victoria, British Columbia, Canada. University of Victoria Vike Kathleen Leahy stands with her teammates following a 3-2 loss (3-1 in penalty shots) to the University of British Coiumbia Thundersbirds in the gold medal match of the CIS Women’s Field Hockey Championships on November 8th, 2015 in Victoria, British Columbia, Canada. University of British Columbia Thunderbird Head Coach Robin D’Abreo celebrates with his family following a 3-2 victory (3-1 in penalty shots) over the University of Victoria Vikes in the gold medal match of the CIS Women’s Field Hockey Championships claiming their fifth straight McCrae Cup on November 8th, 2015 in Victoria, British Columbia, Canada. University of British Columbia Thunderbird wait to be presented with their gold medals following a 3-2 victory (3-1 in penalty shots) over the University of Victoria Vikes in the gold medal match of the CIS Women’s Field Hockey Championships claiming their fifth straight McCrae Cup on November 8th, 2015 in Victoria, British Columbia, Canada. University of British Columbia Thunderbird goalkeeper Rowan Harris jumps in for a team photo following a 3-2 victory (3-1 in penalty shots) over the University of Victoria Vikes in the gold medal match of the CIS Women’s Field Hockey Championships claiming their fifth straight McCrae Cup on November 8th, 2015 in Victoria, British Columbia, Canada. University of British Columbia Thunderbird Cailean Meredith skips across the field following a 3-2 victory (3-1 in penalty shots) over the University of Victoria Vikes in the gold medal match of the CIS Women’s Field Hockey Championships claiming their fifth straight McCrae Cup on November 8th, 2015 in Victoria, British Columbia, Canada. University of British Columbia Thunderbird Hannah Haughn bites her gold medal following a 3-2 victory (3-1 in penalty shots) over the University of Victoria Vikes in the gold medal match of the CIS Women’s Field Hockey Championships claiming their fifth straight McCrae Cup on November 8th, 2015 in Victoria, British Columbia, Canada. University of British Columbia Thunderbirds pose for a team photo following a 3-2 victory (3-1 in penalty shots) over the University of Victoria Vikes in the gold medal match of the CIS Women’s Field Hockey Championships claiming their fifth straight McCrae Cup on November 8th, 2015 in Victoria, British Columbia, Canada. University of British Columbia Thunderbird Captain Katrina Davis carries the McCrae Cup and winning banner back to her bench following a 3-2 victory (3-1 in penalty shots) over the University of Victoria Vikes in the gold medal match of the CIS Women’s Field Hockey Championships claiming their fifth straight McCrae Cup on November 8th, 2015 in Victoria, British Columbia, Canada. For a full gallery of photos from the match follow the link below.